Shock Absorbers - Just a Smooth Ride? The first thing that comes to mind when "Shock Absorbers" are mentioned is - a smoooooth ride! And that's true . 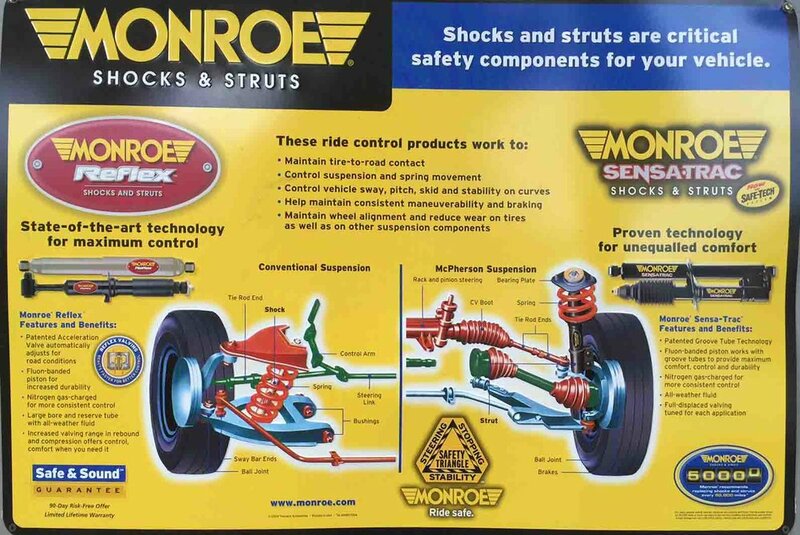 . .
#3) Worn shocks affect your ability to control your vehicle in starts, stops, and turns - a serious SAFETY issue! And lastly, Shock Absorbers are also an important component of costs, in that their lack of performance will cause Brakes and Tires to wear our much more quickly. A rule of thumb is to have your Shock Absorbers reviewed for replacement every 50,000 miles. Callaway's Automotive is a full service vehicle repair and maintenance facility located on the east side of Davis Blvd. in North Richland Hills, Texas about a mile north of Loop 820, a couple of miles from TCC and just about a block from the NRH Post Office. We are real car guys who always say "Take care of your car, and your car will take care of you."